For sale: The Beatles (Diamond Edition) 15K!!! Must Go!!! 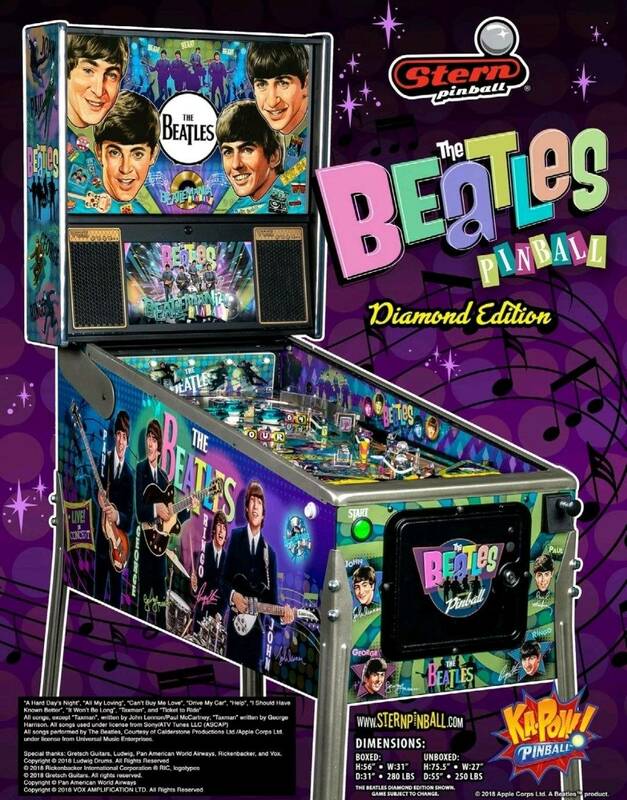 This is a brand new never opened Beatles Diamond edition pinball machine. Limited edition #51. This game is extremely rare only 100 made worldwide. I have significantly reduced its purchase price to sell this game quickly. This game sells for 25k plus shipping. I have put a special package deal together for the ultimate Beatles / Pinball collector. 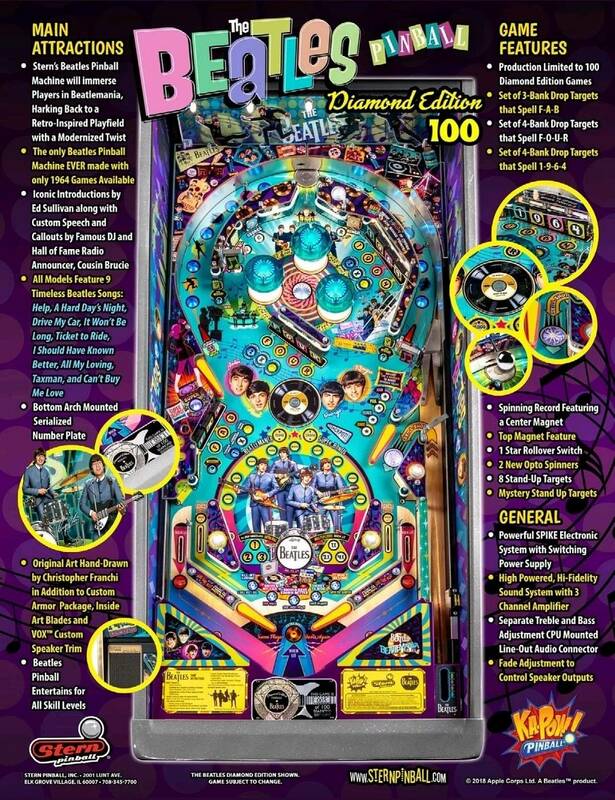 Beatles Diamond edition pinball machine #51. This price includes everything delivered to your door. This game is still new in box strapped to the original Stern pallet. This game is very aggressively priced. There are three models of the Beatles pinball machines. Beatles Gold (1,614 units made), Beatles Platinum (250 units made) and Beatles Diamond (100 units made) The Beatles Diamond is the most rare of all models having only 100 made worldwide. The Diamond edition as you can see here in the attached pictures has a very unique art package that showcases each of the four Beatles on a special mirrored backglass. This is the only version of the Beatles pinball that has a true mirrored Backglass. Other key features exclusive to the Diamond is the Diamond metallic flake powder coating on the trim of the game. On the apron inside of this game it will have a prismatic emblem that indicates this game is #51 of only 100 made. It will also have a matching collectable Beatles certificate that can be framed and hung on a wall near the game. This is an extremely rare collectable game that is a blast to play. This game will be sure to climb in value over the years. Please check around and confirm this is a fantastic price. Currently on Ebay while placing this ad there is one asking 28k plus shipping and no licensed topper. I have been in the amusement industry for nearly 20 years with a fantastic reputation in the community. Buy with confidence knowing before during and after the sale I always take care of my customers. Please call or text anytime for more information. These are ASOA's all time market stats.